Here are some of the press articles & letters arising out of the Never	Again – For Anyone tour, beginning with a major piece on Dr Hajo Meyer in	the prestigious Huffington Post An	Ethical Tradition Betrayed. The tour began in Scotland – the Glasgow Herald	published Auschwitz	survivor: ‘Israel acts like Nazis’ but not IJAN’s	letter in response. The Jewish Chronicle, in one of a number of	attacks on the meeting in the House of Commons on Holocaust Memorial Day,	wrote Gaza	ethnic cleansing talk attacked as ‘an appalling offence’, and did not	publish our letter,	nor would the Independent on Sunday publish Yael	Kahn’s letter. The Camden New Journal wrote a very positive article Auschwitz	survivor, 86, takes on the protesters, as	did Press TV Auschwitz	survivor sees Nazi acts in Israel. The letters column of the Camden	New Journal has carried more attacks, and more letters	defending Dr Meyer. And finally East London Lines reported on the	"controversial" Goldsmiths meeting Auschwitz	survivor sees Nazi acts in Israel. For a video of Dr Meyer’s speech on the tour, please click here. And for three of Dr Eid’s speeches, made especially for this tour, please	click here	& here	& here. See more on the Never Again website. Following the House of Commons meeting, a number of people who had	offered testimony on the genocide of their communities, are continuing to work together. We met at a full-day meeting (no Zionists allowed!). From	this came a collective process to challenge the exclusivity of Holocaust Memorial Day in the UK, and instead speak of genocide rather than holocaust; to make	explicit the genocides and ethnic cleansings historically and today; and to	confront Zionism and the many forms of racism we all face. We will soon be giving you a report of	this effort, and asking for your input. I was 20 years old when Auschwitz	was liberated by the Soviet army 55 years ago. This occurred just in time	because 10 months imprisonment in Auschwitz-Gleiwitz-1 had weakened me	considerably. One needed a hell of a lot of luck in order to survive that	long under the circumstances in that camp. Two important components of luck were on my side. First, during my first years	as a refugee kid in the Netherlands	I had learned to be a locksmith. So during the very strong winter of ’44-’45	I worked in the warmth of a factory. Second, I had acquired a very good and	completely trustworthy friend, called Jos. We helped each other as much as	possible. The two of us did indeed survive. Another aspect of my friendship with Jos was that in spite of — or better,	due to — the extremely high number of people per square foot in such a camp,	one felt extremely lonely. Because of our friendship, mutual help and	absolute mutual trust we were not lonely. This was vital to our psychological	survival. ody from a dominating group who tries to dehumanize people from a	minority group, can only do so if by education, indoctrination and propaganda	he has already been dehumanized himself, independent of the uniform he wears. It is a deep tragedy that in Israel	this is not what one concludes from the experiences in Auschwitz. To the contrary, Auschwitz is elevated there	into a new religion. "In the beginning is Auschwitz,"	wrote Elie Wiesel. "Nothing should be compared to the Holocaust but	everything must be related to it." This elevation has allowed it to be	exploited for political ends. All that was once most valued in a rich and	varied Jewish heritage — the centrality of the ethical tradition, for	instance — disappears beside the Nazi attempt at annihilation. This	Holocaust religion translates in the minds of many into the impossibility	that Israel	can do any wrong. Auschwitz existed within history, not outside	of it. The main lesson I learned there is simple: We Jews should never, ever	become like our tormentors — not even to save our lives. Even at Auschwitz, I sensed that such a moral downfall would	render my survival meaningless. Like most German Jews, I was raised in a secular and humanist tradition that	was more antagonistic than sympathetic towards the Zionist enterprise. Since	1967 it has become obvious that political Zionism has one monolithic aim:	Maximum land in Palestine	with a minimum of Palestinians on it. This aim is pursued with an inexcusable	cruelty as demonstrated during the assault on Gaza. The cruelty is explicitly formulated	in the Dahiye doctrine of the military and morally supported by the Holocaust	religion. I am pained by the parallels I observe between my experiences in Germany	prior to 1939 and those suffered by Palestinians today. I cannot help but	hear echoes of the Nazi mythos of "blood and soil" in the rhetoric	of settler fundamentalism which claims a sacred right to all the lands of	biblical Judea and Samaria. The various forms of collective punishment visited upon the Palestinian	people — coerced ghettoization behind a "security wall"; the	bulldozing of homes and destruction of fields; the bombing of schools,	mosques, and government buildings; an economic blockade that deprives people	of the water, food, medicine, education and the basic necessities for	dignified survival — force me to recall the deprivations and humiliations	that I experienced in my youth. This century-long process of oppression means	unimaginable suffering for Palestinians. It is not too late to learn a different lesson from Auschwitz. 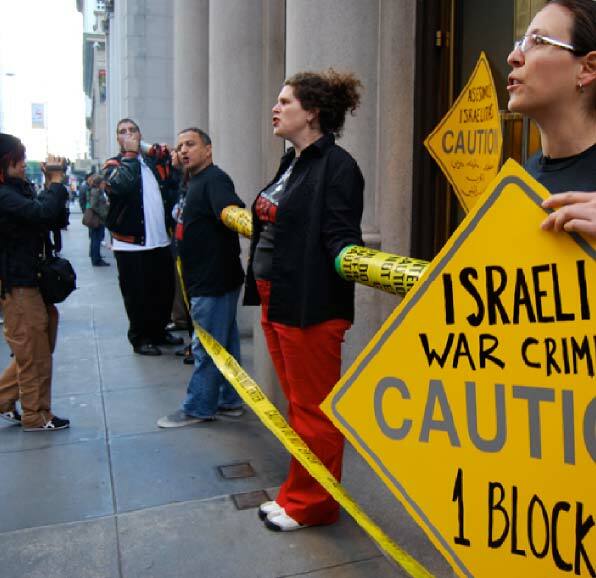 For example, in the last year, the International Jewish Anti-Zionist Network	has become a means for many — including young Jews in the United States — to challenge the precepts of	Zionism and support the Palestinian call for boycott, divestment and	sanctions against Israel. Their goal, and mine, is to challenge the dispossession and exclusivity of a	Jewish state, in their names and in mine. They understand the urgency of the	classical Jewish concept of teshuvah, return from the wrong road. Further,	they understand that the pursuit of justice and making ethically positive	sense out of senseless suffering is not only part of an ancient Jewish	interpretation and shaping of history, but is crucial for all of us in	creating the world we want to live in, and to our moral survival. Hajo Meyer is the author	of The End of Judaism: An Ethical Tradition Betrayed. One of the last remaining Auschwitz	survivors has launched a blistering attack on Israel	over its occupation of Palestine as he began a	lecture tour of Scotland. Dr Hajo Meyer, 86, who survived 10 months	in the Nazi death camp, spoke out as his 10-day tour of the UK and Ireland – taking in three	Scottish venues – got under way. His comments sparked a furious reaction from	hardline Jewish lobby groups, with Dr Meyer branded an "anti-Semite" and	accused of abusing his position as a Holocaust survivor. Dr Meyer also attended hearings at Edinburgh Sheriff Court	on Thursday, where five pro-Palestine campaigners are accused of racially	aggravated conduct after disrupting a concert by the Jerusalem Quartet at the	city’s Queen’s Hall. Speaking as his tour got under way, Dr	Meyer said there were parallels between the treatment of Jews by Germans in	the Second World War and the current treatment of Palestinians by Israelis. He said: "The Israelis tried to dehumanise	the Palestinians, just like the Nazis tried to dehumanise me. Nobody should	dehumanise any other and those who try to dehumanise another are not human. "It may be that Israel	is not the most cruel country in the world … but one thing I know for sure is	that Israel	is the world champion in pretending to be civilised and cultured." Dr Meyer was born in 1924 in Bielefeld, Germany. He was not allowed to	attend school there after November 1938. He then fled to the Netherlands,	alone. In 1944, after a year in the underground, he was caught by the Gestapo	and survived 10 months at Auschwitz concentration camp in Poland. He now lives in the Netherlands, and is the author of	three books on Judaism, the Holocaust and Zionism. Dr Meyer also insisted the definition of	"anti-Semitic" had now changed, saying: "Formerly an anti-Semite was somebody	who hated Jews because they were Jews and had a Jewish soul. But nowadays an	anti-Semite is somebody who is hated by Jews." A spokesman for the International Jewish	Anti-Zionist Network, of which Dr Meyer is a member, said criticising Israel	was "not the same" as criticising Jews. Mick Napier, Scottish Palestine ­Solidarity	Campaign chairman and one of the five demonstrators facing charges when the	court case continues in March, said: "Palestinians are happy to have him as an	ally in their cause. "Hajo knows that Israel has a long history of	abusing the tragic history of the Holocaust in order to suppress legitimate	criticism of its own crimes. "Especially since Gaza,	people are no longer taken in by their claim that anyone that criticises Israel	is anti-Semitic." Dr Meyer’s claims met with a furious	reaction from pro-Israel groups, who branded him "a disgrace". Jonathan Hoffman, co-vice-chairman of the	Zionist Federation, said: "I shall be telling him he is abusing his status as	a survivor, and I shall be telling him that if Israel had been created 10 years	earlier, millions of lives might have been saved. "Whether he is a survivor or not, to use	Nazi comparisons in relation to Israel’s policies is	anti-Semitic, unquestionably." The tour was cynically timed, Mr Hoffman	added, to coincide with Holocaust Memorial Day on January 27.
el Information Office, accused the anti-zionist lobby of "exploiting"	Dr Meyer, who he described as someone "who’s got into a situation he doesn’t	understand". "This is a propaganda exercise by Mick	Napier and his friends, and nothing more. It’s preposterous to compare Israel	with Nazi tactics." The lecture series, entitled Never Again –	For Anyone, continues until January 30. The comments on	January 24th of Jonathon Hoffman, co-vice-chair of the Zionist	Federation, are typical of the arrogance of the Zionist lobby. Who is	Hoffman to deny the experience of Hajo Meyer-who survived all twelve years of	the most horrific wave of anti-Semitism in history, including 10 months in Auschwitz? Who is he to give Mr Meyer lessons on	anti-Semitism? Hoffman reveals the Zionist selective use of the Holocaust to	further the interests of the State of Israel. In fact, the	Zionist collaboration with the Nazis to bolster the case for the State of	Israel is well documented. An example of this is the Ha’avara treaty between	the Nazi government and the Zionist leadership. The Nazis allowed only rich	Zionists to take their money and families out of Germany. In exchange, they	bought and shipped German machines to Palestine,	thereby stimulating the German economy. A portion of the proceeds were	deposited in bank accounts giving the Nazi government access to foreign	currency. Zionists were key to breaking the international Jewish-led economic	boycott of Germany. Furthermore, the	founding leadership of Israel	made clear their contempt for the Jewish survivors of the Nazi genocide; they	had use only for the memory of their suffering. Historical records are full	of statements by leading Zionists expressing concern that refugees —	"useless human material" — would "poison" the new state of Israel and drain its resources. Hajo is appalled at the use of his	suffering to justify the ethnic cleansing of Palestine. Hajo is "human material" who was	the Director of Research for the largest electronics multi-national	corporation of Europe. Contrary to the	condescending comment of Dr Ezra Golombok, Scottish spokesman for the Israel	Information Office, that Hajo has got himself "into a situation he doesn’t	understand," Hajo well knows the difference between Judaism and Zionism,	between anti-Semitism and criticism of Israel, and between a commitment	to collective humanity and the political interests of an imperialist State. The point of the comparison is not whether	or not the Nazi genocide of Jews and of so many others is the same as the	Israeli slow motion genocide of the Palestinians. It is that dehumanisation	of a minority is possible only after the dominant group has first dehumanized	itself through indoctrination, fear and propaganda. This opens the way for	displacement or worse of others. To summarize the words of IJAN member Hajo	Meyer: the only way we see fit to honour the Nazi genocide of the Jews and others	is to stop current genocide and state-directed mass murder, beginning in	Palestine, in our name and against our collective humanity. We say never	again, for anyone, anywhere. Jewish and pro-Israeli organisations have	attacked a talk given at the Houses of Parliament comparing Israeli action in	Gaza to the	Shoah suffering of Jews. Chaired by Labour MP Jeremy Corbyn, it	featured Auschwitz survivor Hajo Meyer and	Palestinian activist Haidar Eid, on a speaking tour organised by the Scottish	Palestine Solidarity Campaign and International Jewish Anti-Zionist Network. Dr Meyer spoke against "Nazi genocide of	Jews to justify the ethnic cleansing of Palestine	by the state of Israel"	while Dr Eid spoke by via link from his Gaza	home. Organisers said they had invited	communities to "remind us of their resistance to the mass taking of life, in	this way honouring all resistance and undermining the racist Zionist view of	Jewish exceptionalism". The Zionist Federation said holding the	event, Never again – for anyone, at Parliament on Holocaust Memorial Day was	an "appalling offence" to the Jewish community. Speaking beforehand, Mr Corbyn said the	Shoah was an "appalling period in history which will never be forgotten",	adding: "Hajo has survived and spent the rest of his life working and	campaigning for justice for people all over the world. He has spoken out	against the dehumanising effects of occupation very forcefully. Sadly, for	much of this he has been condemned, which I regret." Gili Brenner of the ZF	said: "The shameless abuse of freedom of speech to demonise Israel on a day which	commemorates the biggest tragedy in human history crosses a dangerous line." Jon Benjamin, Board of Deputies chief	executive, said: "This latest attempt to exploit the most painful chapter in	Jewish history in order to berate and demonise Israel is among the most	despicable." For further attacks on Dr Meyer in the	Jewish Chronicle website, see for example: Come	and see Hajo – the Amazing Dancing Bear. We brought together Auschwitz survivor Dr Hajo Meyer and	Palestinian activist Dr Haidar Eid (via live telephone link from Gaza) and speakers from	communities that had suffered and resisted genocide and other forms of	mass-murder: Armenian, Irish, Native American, Roma, Rwandan, and	others. Our aim is to realise the expression: never again, for anyone,	anywhere. Yet Dr Meyer was insulted and attacked by the JC: Jonathan	Hoffman calls Dr Meyer "the Amazing Dancing Bear" (January 24); your article	headlines the meeting as "an appalling offence" (28 January); and at the	meeting itself Zionists tried – and failed – to prevent Dr Meyer speaking. One Zionist gave the Nazi salute & shouted "Heil Hitler" as MPs had	police remove him. they think it is also directed at them- and they are right. We	know the difference between Judaism and Zionism, between anti-Semitism and	anti-Zionism, and between commitment to collective humanity and commitment to	the interests of an apartheid	State. In coming	together to stop the ‘slow-motion genocide of Palestine’	we are Zionism’s enemy, and every day since Gaza more Jewish people are with us. Anne Karpf rightly says that	"philo-Semitism is a form of anti-Semitism" ("Anti-Semitism is	at the limits of irony", 7 February). I wonder how she would	define abuse of Holocaust survivors and Jewish Rabbis in traditional Jewish	garb if the attackers claim to support the rights of Jews? This is not a hypothetical situation nor	from decades ago, but an actual event in the House of Commons and of all	days, on Holocaust Memorial Day (27 January 2010). A Jewish Auschwitz	survivor was repeatedly shouted at and was stopped many times from speaking	about Auschwitz. He and other Jews,	including a Rabbi, were persistently attacked, in spite of repeated police	warnings, until 4 of them were escorted out. One of the attackers made the	Nazi salute and shouted the Nazi obscenity, "sieg heil". While not	all the attackers were Christians, they were all Zionists, in fact, mostly	Jews. The Jewish victims were all anti-Zionists. As Anne Karpf rightly says "We should	never be complacent about anti-Semitism" – should attacks like that on	the 27 Jan 10 be exempted? IT’S	not often you meet a have-a-go hero, let alone three! I met spritely	86-year-old Dr Hajo Meyer, a survivor of the Nazi death-camps, at the House	of Commons. At	a Holocaust Memorial Day ceremony, Dr Meyer spoke about the Nazis and pleaded	for an end to the war against Palestinians. Israel, he said, was	"dehumanising the Palestinians as the Nazis tried to dehumanise me". But	when a dozen protesters tried breaking up the meeting, shouting pro-Israel	slogans and hurling abuse at Dr Meyer, they met their match. The plucky	professor – barely over 5ft – refused to back down. "I grew up under Hitler	and lived through Auschwitz. I’m not scared	of people like you," he told the burly protestors. Islington	MP Jeremy Corbyn, who helped organise the meeting, had to call the police and	it took several officers to cart the men away. Minutes later we heard the	voice of another hero. Speaking by telephone from Gaza,	Dr Haider Eid reported how Israel’s	blockade of the enclave has cut power and plunged its 1.3m people into darkness. Because	of the embargo families are in tents, orphans on the streets, food and	medicines have dwindled, he said. But he wanted pay tribute to the tens of	thousands of Jews trapped by the Nazis in the Warsaw Ghetto. The	meeting was chaired by Hampstead resident Selma James, 79 year-old widow of	the black writer CLR James. I HAD the privilege of seeing Auschwitz survivor Dr Hajo Meyer’s courage in the face	of the repeated attacks at the House of Commons meeting, and he certainly did	not look like someone "wheeled out… who has been bamboozled…" (letter by	Nicole Segre, February 25). The attacks at Dr Meyer on the Holocaust	Day event escalated until House of Commons police escorted out a Jewish	Zionist official. Then another heckler was escorted out by a	policeman but, just when he passed next to us, mainly Jewish people, he	shockingly waved his hand in the Nazi salute and shouted "sieg heil". By	contrast, John Gulliver showed his humanity in his compassionate article	about the keynote speaker 86-year-old Dr Meyer (February 4). With dignity Dr Meyer watched the hateful	hecklers, only to resume his coherent account of his personal experience and	historical analysis. Unfazed in the face of the Zionist	attackers, he told the audience of the lessons on the Siege of Gaza to be	learned from the Holocaust. Dr Meyer’s talk was a special inspiration	for me, being an Israeli, currently having regular contact with Gaza, and a daughter of	parents who escaped Nazi Germany. I find Dr Meyer’s lessons poignant,	especially when I face denial and silence in spite of the evidence of the	death, hunger and suffering caused by the merciless siege of Gaza	imposed by Israel. THE treatment of Auschwitz	survivor Dr Hajo Meyer by Zionist Jews comes as no surprise to people like me	who have personally experienced the kind of thuggish behaviour they regularly	indulge in. As a Jewish person who has been on the	receiving end of their threats and intimidation, I regard it as important for	others to know that bullying and cowardice are their stock in trade. The only	useful thing to take from their behaviour towards Dr Meyer is that it reveals	once again their disdain for civility, the bankruptcy of their politics and	the perversity of their claim to speak for the welfare of Jewish people	whether they live in Israel or any place else. WE brought together Auschwitz survivor Dr	Hajo Meyer and Palestinian activist Dr Haidar Eid, whom the Israeli blockade	prevented from leaving Gaza	but who addressed the meeting via live telephone link, (Letters, Yael Kahn, Holocaust	survivor’s courage, March 4). They were joined by speakers from communities who had also suffered and	resisted genocide and other forms of mass murder: Armenian, Irish, Native	American, the Atlantic slave trade, Roma, Rwandan, and others. Our aim is to realise the true meaning of Never Again, not only for Jews but	for anyone anywhere. Why did Zionists attack Dr Meyer? Why do they want Jewish people to be the exception? Dr Meyer, whom Zionists have always failed to silence, knows the difference	between Judaism and Zionism, between anti-Semitism, and anti-Zionism and	between commitment to collective humanity and commitment to the interests of	an apartheid state. A Nazi death camp survivor slams Israel over its occupation of Palestine, drawing an	analogy between the Israeli army’s indignations and the conduct of Nazi	forces during World War II. "The Israelis tried to dehumanize the	Palestinians, just like the Nazis tried to dehumanize me," said Dr Hajo	Meyer, 86, who survived 10 months in Auschwitz Nazi concentration camp in Poland. "Nobody should dehumanize any other	and those who try to dehumanize another are not human," he said at the	beginning of his lecture in Scotland. The octogenarian Holocaust survivor, who	embarked on a 10-day tour of the UK	and Ireland, called Israel	"the world champion in pretending to be civilized and cultured." The comments by Meyer have provoked a fresh	outcry of "anti-Semitism" by hardline Jewish lobby groups. However, Meyer, the Dutch-based author of	three books on Judaism, the Holocaust and Zionism, dismissed	"anti-Semite" labels hurled against him. "Formerly an anti-Semite was somebody who	hated Jews because they were Jews and had a Jewish soul. But nowadays an	anti-Semite is somebody who is hated by Jews," he stated. A spokesman for the International Jewish	Anti-Zionist Network, of which Dr. Meyer is a member of, backed the remarks. "Hajo knows that Israel has a long history of	abusing the tragic history of the Holocaust in order to suppress legitimate	criticism of its own crimes," said the spokesman. An 86-year-old Holocaust survivor was	heckled by pro-Israelis while giving a controversial talk on Wednesday	night at Goldsmiths	University in Lewisham. Dr. Hajo Meyer delivered his talk, ‘The	Misuse of the Holocaust for Political Purposes’, on the eve of Holocaust Memorial Day .His	criticisms of the Israeli government were met with aggression by two audience	members, who shouted interruptions during talks by both Dr. Meyer	and fellow speaker, Palestinian Journalist, Haidar Eid. They also	held up signs with the word ‘lies’ written on them. In 1944 Dr. Meyer spent 10 months in Auschwitz; the largest of the World War II concentration	camps. He is now a published essayist based in the Netherlands, and is involved in campaigning	for ending, what he views as, the occupation of Palestine. He is delivering a series of	talks as part of a tour organised by the International Jewish Anti-Zionist Network. The Network’s Founder, Sarah Kershnar,	claimed they had not been allowed to list any of the talks on the	official Holocaust Memorial	Trust website due to their position on the Israel-Palestine conflict. Ms.Kershnar said: "We tried three times and it wouldn’t go through." She has launched a petition in response to	the banning, but when EastLondonLines approached The Holocaust Memorial Day	Trust, they denied having received the submission from IJAN. James Haywood, the Goldsmiths College	student who organized the hosting of the talk for IJAN, said he believed it	contributed an important perspective to the Memorial Day; "The talk we’re	holding tonight is not conventional but its important to remember that racism	in all its forms is bad." Other East London	line boroughs, Croydon and Hackney, hosted more traditional ‘Candle Lighting	Events’ yesterday to commemorate Holocaust Memorial Day.